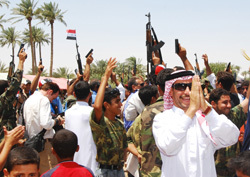 Success in al-Anbar: Can it be sustained? Middle East expert Wayne White writes that our new bottom-up alliances have great potential – as long as we don’t overstay our welcome. But they also may be setting the stage for a supercharged civil war. Q. How long can we reasonably expect tribal elements and former insurgents in predominantly Sunni Arab areas of Iraq to remain cooperative? Q. What are the advantages and possible dangers inherent in this cooperation? Q. Do these alliances mean we no longer need to worry about Iraq becoming a haven for terrorism after we leave? Q. Wouldn’t this be a good time to start clearing out? Clearly, this alliance of convenience has been of great value. It has enabled U.S. forces, and their new Sunni Arab allies, to inflict severe blows upon al-Qaeda in Iraq (AQI) and other likeminded jihadi terrorist elements. The longer this arrangement can be extended -- and expanded into additional Sunni Arab areas -- the greater the chance that much of the AQI presence in Iraq can be eradicated. Perhaps most importantly, the alliance probably means that even following a withdrawal of U.S. forces, it is unlikely that AQI will be able to regain a significant foothold in Iraq. Tribal and insurgent elements attacking AQI elements or assisting U.S. forces in doing so now have a price on their heads and have every reason to resist strongly attempts on the part of AQI to return. Consequently, the principal concern related to post-U.S. withdrawal scenarios -- that substantial portions of Iraq would become havens for terrorists -- is much reduced. Nonetheless, the Sunni Arab elements now cooperating with U.S. forces are also the ones most bitterly opposed to the U.S. occupation. In addition, they are largely hostile to Iraq’s Shi’a and Kurdish-dominated central government, which is viewed as anti-Sunni Arab and pro-Iranian. Yet another problem lurks down the road. The U.S.-Sunni Arab alliance of convenience has enabled large numbers of Sunni Arabs to organize and further arm themselves to a degree that would have been unimaginable when they were forced to operate underground. Also, they have joined local security forces, like the police, in large numbers, giving them access to resources previously beyond their reach. It therefore comes as no surprise that Prime Minister Nouri al-Maliki and his supporters have strongly opposed this cooperation -- so much so that in at least one area west of Baghdad a largely Shi’a Iraqi army unit forcibly tried to halt such activity, compelling U.S. troops to step in to protect their new allies. Maliki and others in his camp know that in the context of a Sunni Arab-Shi’a-Kurdish civil war farther down the road (a possibility they take very seriously, and with good reason), Sunni Arabs increasingly are positioning themselves to resist more robustly than ever before any further Shi’a and Kurdish efforts to push Sunni Arabs out of mixed areas of the country. Possibly the greatest potential opportunity here is for an orderly U.S. withdrawal. As AQI is taken down and because of the danger of renewed Sunni Arab resistance, U.S. military commanders would be well-advised to capitalize on their new relationship with the Sunni Arab community to withdraw their troops from what were once the most dangerous areas of the country in an orderly fashion and with far fewer casualties than might have been the case even just six months ago. By contrast, if we overstay our welcome in such areas, not only could U.S. forces once again come under attack, they could find themselves caught in the midst of much more deadly ethno-sectarian strife -- even civil war -- especially if parallel arrangements with the Shi’a Mahdi Army allow that unpredictable and dangerous militia to regroup and rearm. Sunni Arab resentment against abusive AQI cadres or other jihadis in their midst became apparent as far back as 2004, when I was still in government. Beginning in 2004, Sunni Arab notables -- as well as insurgents via intermediaries -- have approached U.S. forces seeking, in the main, much the same relationship with U.S. forces they have now. However, apparently until the end of last year, the response was that such cooperation must include a reconciliation with the central government -- a condition anathema to most Sunni Arabs. One wonders how much earlier the U.S. could have benefited from the successes of the past nine months had there been greater flexibility toward how to approach Iraq’s disenfranchised Sunni Arab community. By late 2005, it should have been clear that the central government was dysfunctional and dominated by parties far less interested than the U.S. in Iraqi national reconciliation. Clearly, a failure to understand the plight of Iraq’s Sunni Arabs has plagued the U.S. effort in Iraq since the fall of Baghdad. Wayne White is a scholar at Washington’s Middle East Institute and a Policy Expert at Washington’s Middle East Policy Council. In 2005, he retired as Deputy Director of the Near East and South Asia Office in the Department of State’s Bureau of Intelligence and Research. Is it possible that Mr. White doesn't know that 100% of the Sunnis in Anbar approve of attacks on Americans? In the latest NY Times poll, (Gary Langer, NY Times 9-16-2007) "Every Anbar respondent called attacks on coalition forces “acceptable,” far more than anywhere else in the country." Anti-American Sunnis shot up a few anti-American jihadis in Anbar, and that's all the good news anyone can find for the Americans in Iraq.